Join the party with everyone's favorite screen sweetheart, Sandra Bullock... 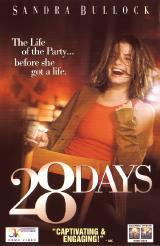 Billed as ''Bullock's finest performance of her career'', 28 Days chronicles a party girl's one month stay at a rehab center for alcoholics. Smart, funny and utterly irresistible, 28 Days is a journey that every movie-goer should take. Co-starring Viggo Mortensen, Elizabeth Perkins and Steve Buscemi, 28 Days is as charming as it is scintillating!